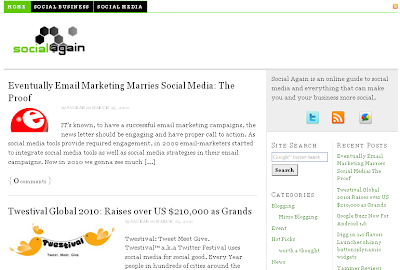 Social Again Launched - Blogging to Fame! “Social media offers new opportunities to activate…brand enthusiasm.” said Stacy DeBroff, founder and CEO of Mom Central. Social Again connects the dots to explore the reason why is it important for companies to go social, not only by creating compelling content but by engaging with people, encouraging them to share their ideas and knowledge. Also, Social Again will talk about latest industry trends, product reviews, events, blogging ;) , campaigns, communities, and lots more... I know you get the point. I would be cross posting what we write on social again here. Having said that you can visit Social Again now. If companies need to go social Divya, then, blog marketing is one of the ways. Don't you think blogging is social? Waiting for your bloggingtofame.com site to launch. I am sure it will carry all your stamps. Yes, blogging is the first step to go social... very basic yet essential. A company needs to establish a fully integrated strategic road map for all the channels and media.